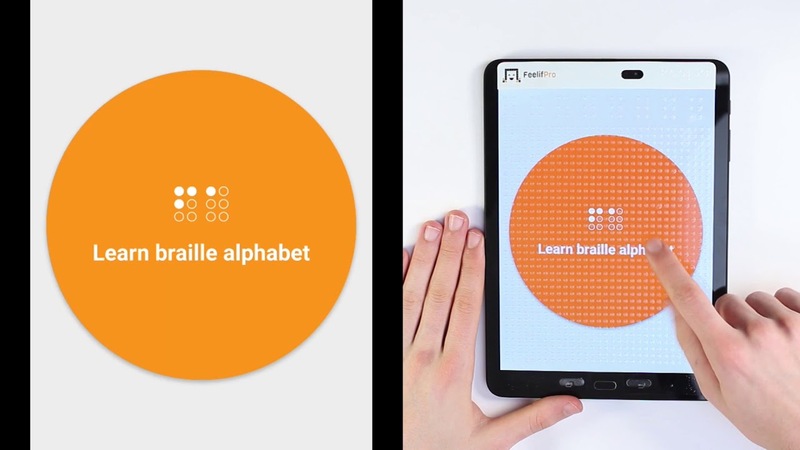 Feelif Learning Braille is a unique application that helps beginners learn the pattern of Braille alphabet cells in a fun way. The Braille games are designed after the exercises usually performed in schools. In addition, they are packaged with fun multisensory experiences that make learning fun. They are for those who want to quickly and easily learn the Braille system and improve their finger skills. If the dot is active (a normally raised dot on a Braille display), the device will vibrate and you will hear a humming sound supporting it. If the dot is not active, the device will stay quiet and still. This way the user will learn the position of active dots in a Braille cell. Learn Braille Alphabet and the position of each dot for a specific letter. Find Missing Dot is an exercise for the user to find the dot in the cell that does not vibrate. Copy Braille Characters is to recognize the character in the braille cell and to repeat in the second cell. Write Braille Characters exercise goal is to try out your knowledge of the braille alphabet. The exercises use the embossed jumbo braille cells on the top of the screen. These braille dots are intentionally larger than normal braille dots, to help little fingers feel and select the individual dots and to focus on the spatial relationships of these dots. See how you can learn the braille aplpahebt on Feelif.